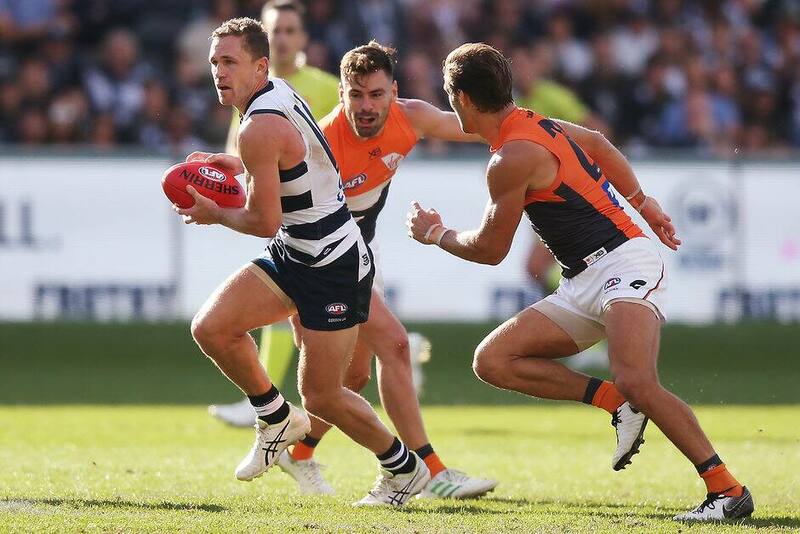 Captain Joel Selwood was named in the Cats' best. COURAGEOUS Greater Western Sydney has broken Geelong's unbeaten run and posted its first win at the Cattery, triumphing by four points in a nail-biter at GMHBA Stadium on Saturday. The undermanned Giants strengthened their premiership claims with a brilliant come-from-behind win over Chris Scott's men, prevailing 11.13 (79) to 11.9 (75). This was a victory full of character for Leon Cameron's team, who were reduced to 21 men in the opening minutes when co-captain Callan Ward, in his first outing for the season after returning from a right knee injury, suffered a suspected anterior cruciate ligament rupture in his left knee. The plucky visitors also came from 22 points down early in the third term to control play for most of the second half, keeping their cool in the dying stages to hold out the Cats' last-ditch attempt for a match-winning goal after a Tom Stewart kickout up the corridor. History was also against the Giants, given they had lost their past three games on the road and their previous four at Geelong, where the Cats had won 26 of their previous 29 games. GWS has now joined Geelong on a 3-1 record – a terrific result for a team that has been challenged by injuries to key personnel. The Giants' tall forward trio Jeremy Cameron (three goals), Jeremy Finlayson (three) and Harry Himmelberg (two) again proved pivotal, and they were superbly served by the orange wave of runners led by Lachie Whitfield, Stephen Coniglio, Jacob Hopper, Josh Kelly and Tim Taranto. Early on it seemed Geelong would cruise to 4-0. The Cats dominated proceedings, creating eight of the first nine forward 50 entries and firing the first five scoring shots for a return of 2.3 to nil after 15 minutes. They should have been further in front – Patrick Dangerfield also sent a set shot out on the full and Mitch Duncan hit the post with a regulation snap. The Giants finally hit back at the 20-minute mark through Finlayson, via a gift from Himmelberg, but the Cats reasserted their ascendancy with quick goals to Gary Rohan and Tom Hawkins from long set shots. With key playmakers Patrick Dangerfield and Duncan and youngsters Brandan Parfitt and Gryan Miers busy, Geelong led by 21 points early in the second term, before the Giants finally found their mojo. Despite being one man down, the visitors responded with three of the next four goals to get within eight points as Whitfield, Coniglio, Hopper and Kelly controlled the tempo of play and stopper Matt de Boer tightened his clamps on Tim Kelly (ultimately keeping him to just nine disposals, one clearance and one goal). Once again, Geelong broke free late in the quarter, restoring order with two goals in the last minute before half-time. The Cats extended their lead after the break to 22 points – which would have been 27 points had Sam Menegola nailed an elementary running shot from close range – and that was the cue for another rearguard action by the Giants. Cameron proved too nimble for Cats veteran Harry Taylor to slot two goals in 90 seconds, sparking his ultra-efficient team to snare 6.4 for the term from just 11 inside 50s, to the Cats' 3.2, which included two long set-shot goals from Gary Ablett. Daniel Lloyd's second goal, at the 27-minute mark, gave the Giants the lead for the first time, before Hawkins soon regained the ascendancy. Ward addressed his teammates at the final change, urging them to make a big last-quarter effort, and Cameron, now opposed to Mark Blicavs, hauled in a strong contested mark early in the final term only to miss badly and level the scores. Hawkins set up Rohan for an easy goal before Himmelberg claimed a courageous mark and passed to Finalyson, who snapped a superb major from the boundary to tie it all up again. The Giants, holding the ascendancy around the stoppages and maintaining composure, had the next four scoring shots, all behinds, before the final siren stunned the local crowd.